The great room’s focal point is the fireplace. These days, formal living and dining rooms are on the way out, says interior designer Kalah Talancy, an interior designer who teams with her husband, architect Kevin ten Brink, to run KT2 Design Group. 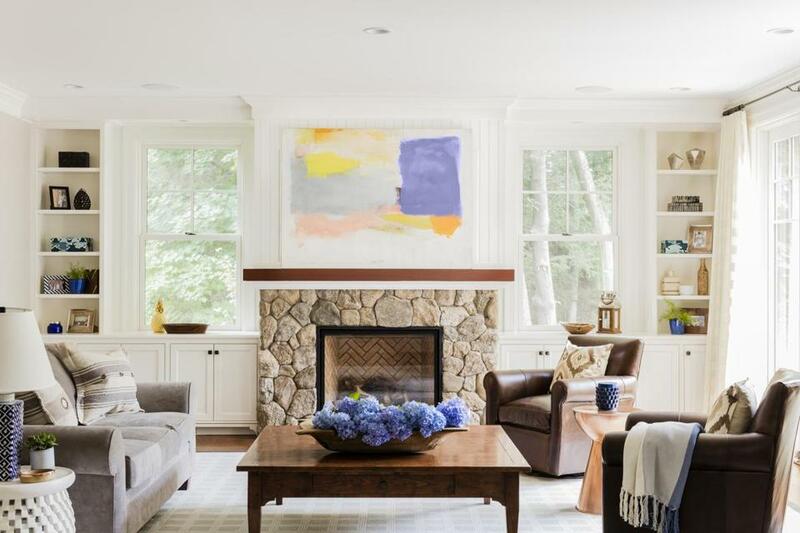 For this new Wellesley home on which the duo collaborated, the first-floor plan centers on a more casual great room that opens to the kitchen and dining room. To make the space feel homey, Talancy selected a large soft Karastan rug with a gridded motif finished with a wide chocolate brown binding. “The rug is a grounding element in the room,” says Talancy. Stripped sheers by Lulu DK frame the windows. “While drapes weren’t necessary from a privacy standpoint, window treatments soften the room,” says Talancy. In the eat-in-kitchen, where the family eats most meals, a built-in bench — upholstered in easy to clean indoor-outdoor fabric — maximizes the number of people that can sit around the rustic table. Instead of hanging the kids’ artwork on the refrigerator, two burlap bulletin boards from Ballard Designs give them a place to express themselves. Plaid roman shades add dimension to the mostly neutral space. A burlap bulletin board displays kids’ art.